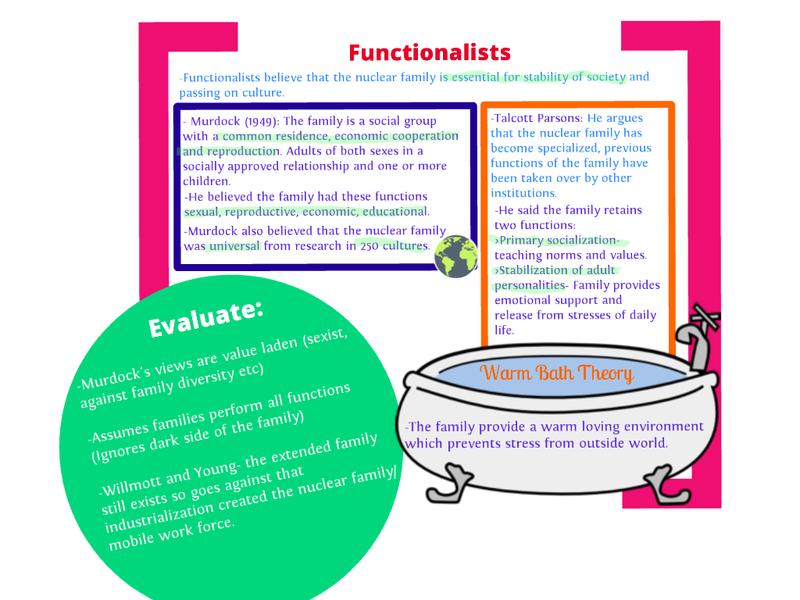 Stage 1 – the pre-industrial family -the family is a unit of production with all family members working as a team in order for the family unit to survive. They agree with the idea this type of family was superseded by the industrial revolution. (this type of family hasn’t disappeared as some farming families still work this way. 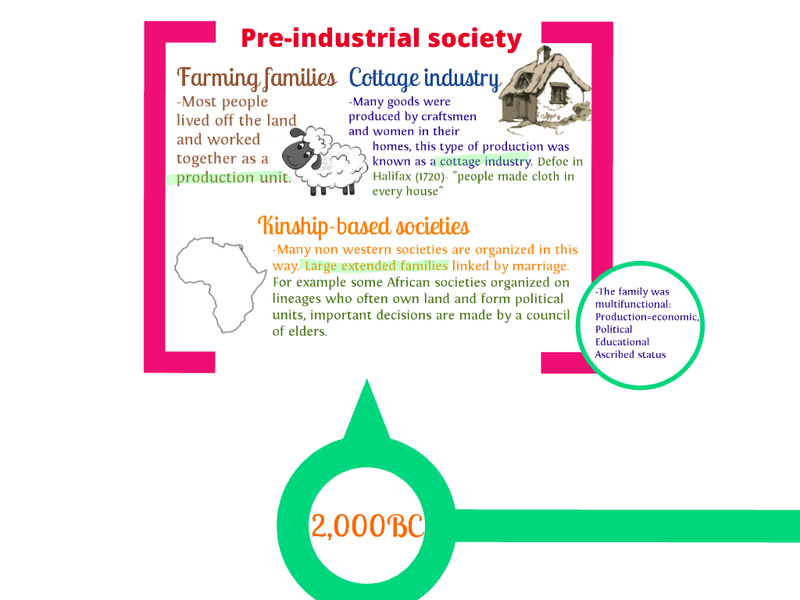 Stage 2 – the early industrial family – was an outcome of the industrial revolution, developing from the early 19th century running through to its peak the early 20th century. As family members increasingly became employed in factories the site of the family as a unit of production faded. The difficulty for families was factory wages were very low which was made worse by significant periods of prolonged unemployment. According to Young and Willmott this encouraged families to create ‘insurance’ by inviting relatives beyond the nuclear family into its network. This proliferation of network ties was a distinct feature of the Stage 2 family. It weakened the conjugal bond in favour of greater ties between mother and married daughter to create an organised and informal network between women which excluded men. Young and Willmott study found men had been eased out of the female circle to find ‘comfort’ in the pub. This gulf between male and female family roles was evident in the distinct division of labour between husbands and wives in the household. Segregated conjugal roles meant men had very little involvement in domestic chores, raising the children and leisure activities. 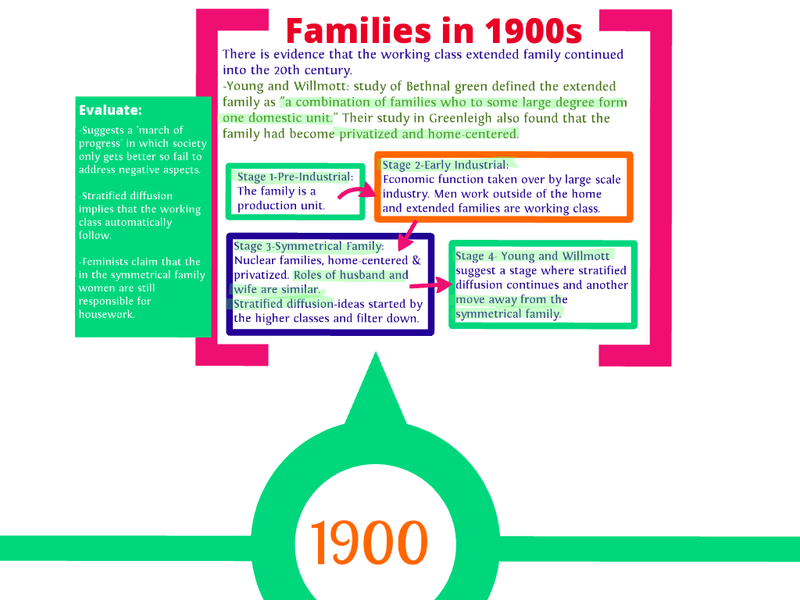 These family networks started to decline in the early 20th century but were still found in many low-income, established working class areas. Young and Willmott’s evidence comes from their Bethnal Green study (mid- 1950s) which uncovered how children usually remain within 2-3 miles of their family home. 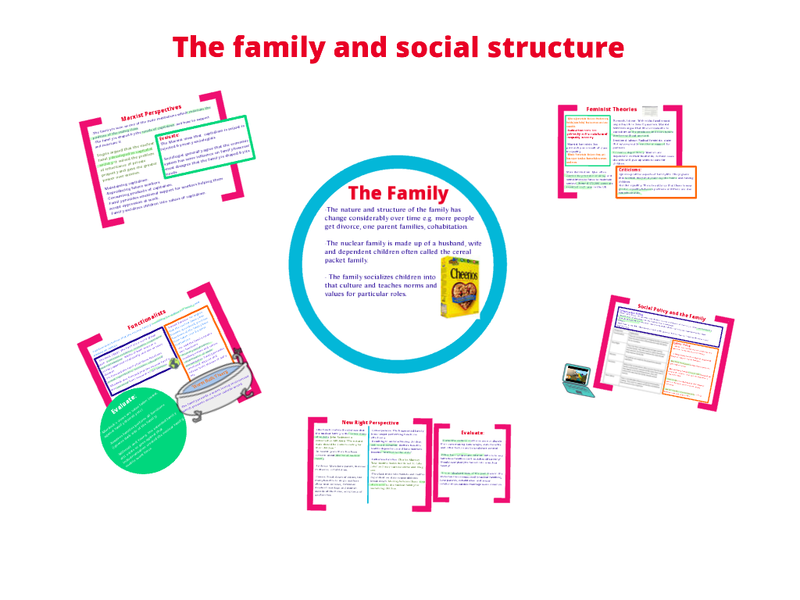 Stage 3 – the symmetrical family (sometimes known as privatised nuclear family) – Young and Willmott’s book The Symmetrical Family was based on 1970s large-scale social research they’d conducted in Greater London which uncovered the demise of the Stage 2 family in favour of the Stage 3 family. 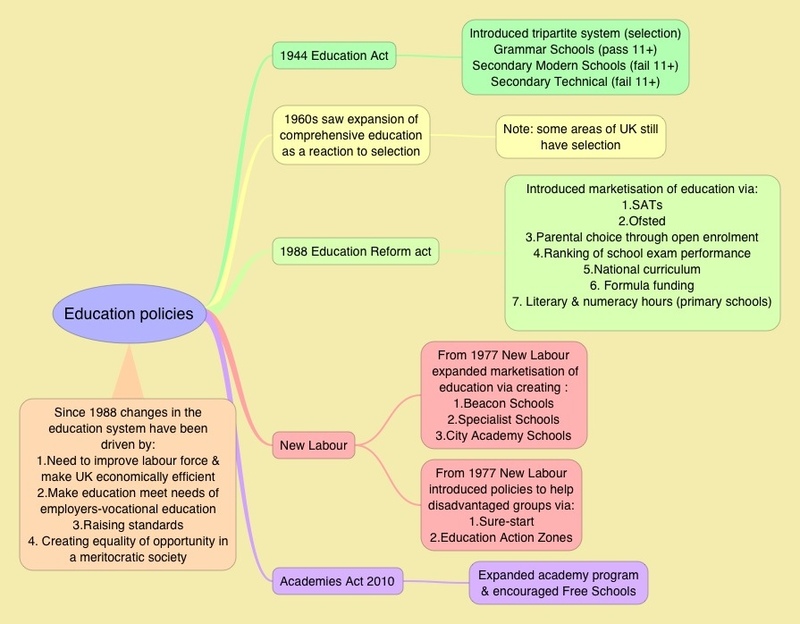 This shift was particularly profound within the working-classes. The term symmetry refers to how the family is an arrangement of opposite parts in sense of how each adult’s contributions are similar in the running of the household through joint conjugal roles. The symmetry comes from there being ‘men’s’ and ‘women’s’ work – sharing decisions, chores etc; but most importantly their roles are not interchangeable. 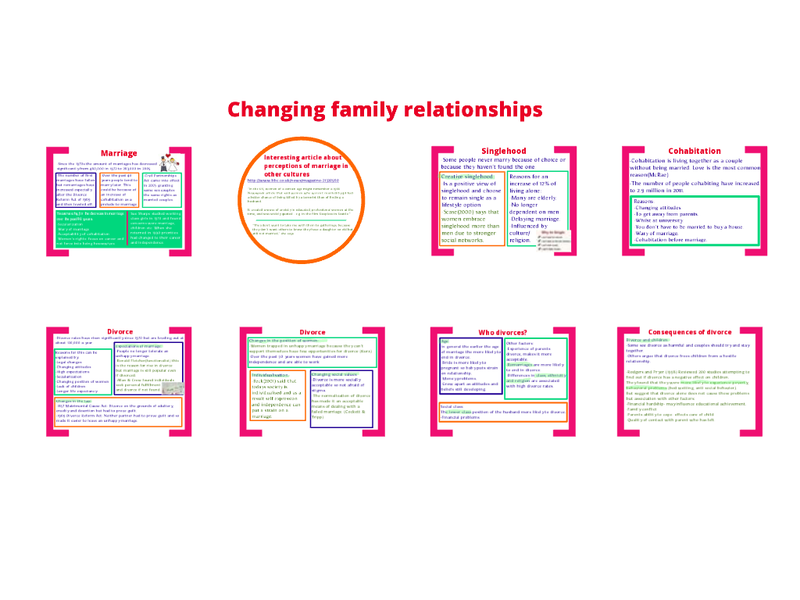 Young and Willmott identified four reasons for why this shift from the Stage 2 to Stage 3 family structure occurred. Stage 4 family – (the future?) – Young and Willmott predicted the rise of the Stage 4 family whereby using their ‘Principle of Stratified Diffusion’ theory (lifestyles of those who are at the top of the social ladder are gradually adopted by those at the bottom). Studying the family life of 190 managing directors they concluded that in the future, families in other social classes will adopt their family lifestyle. This implies that the fourth stage will be characterised by ‘work-centred’ individuals, leisure time spent outside the home and wives looking after the home and the children. 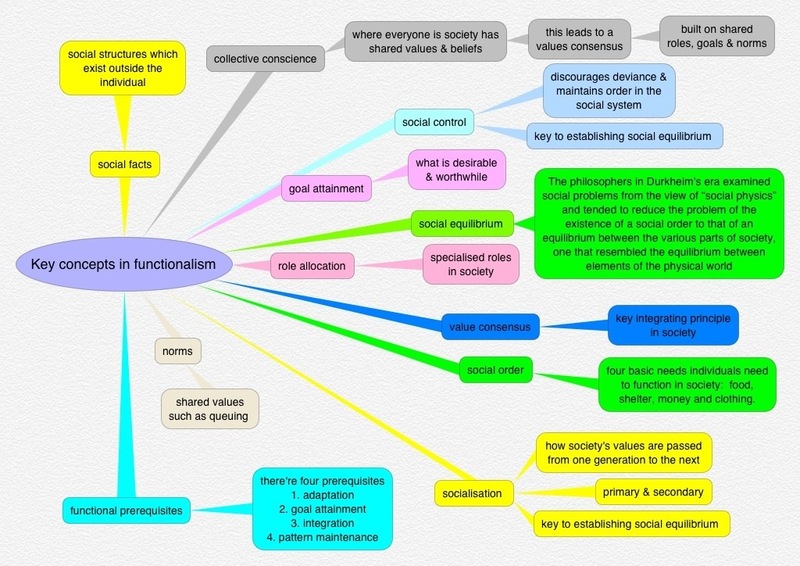 The certainty functionalists have over the future of the family are evident in this summary. 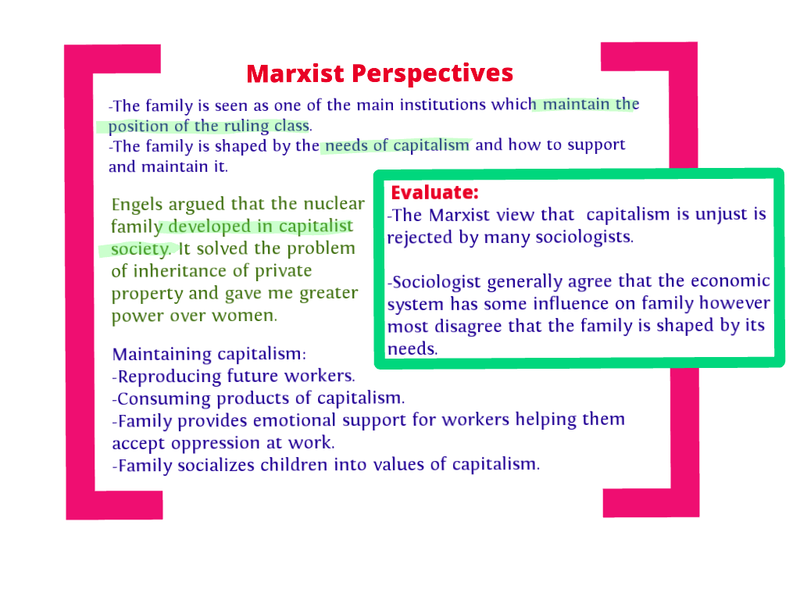 However not all sociologists are as confident over the future for the traditional family, instead they prefer talking about family diversity.